Olives. 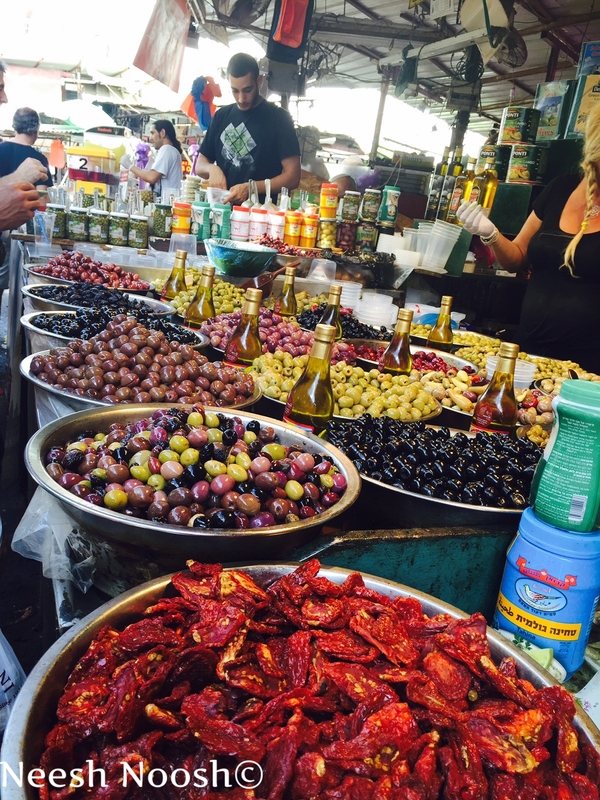 Shuk HaCarmel, Tel Aviv. The recipe I created for Kislev uses lots of salt and olive oil but it is not another recipe for latkes! Since Kislev is celebrated during a dark, cold time of year, I offer a dish whose brightness will counter the damp weather and provide lots of nourishing ingredients. It is a salty and oily salad made with an array of bright foods, symbolic of the rainbow, with pieces cut into arches. Indeed, eating a rainbow of foods is not only good for one’s health, but critical for sustainable agriculture. As part of our covenant with God, we are required to protect Creation. We can be inspired by Noah, the first seed saver and protector of biodiversity. Our agricultural practices–what and how we grow–are critical to environmental sustainability. Indeed, monocropping, lack of biodiversity in seeds, and use of chemicals and fertilizers endanger our food supplies and environment. Such practices remove critical nutrients from soil, leave crops vulnerable to disease (think of the Irish potato famine) and undermines the genetic diversity of our food supply. Persimmons. Shuk HaNamal, Tel Aviv. 1. Wash the lettuce and tear into pieces. 2. Soak in olive oil (about 3-4 tbsp total) and then cut into pieces. Place on tray in toaster oven at 375 degrees. 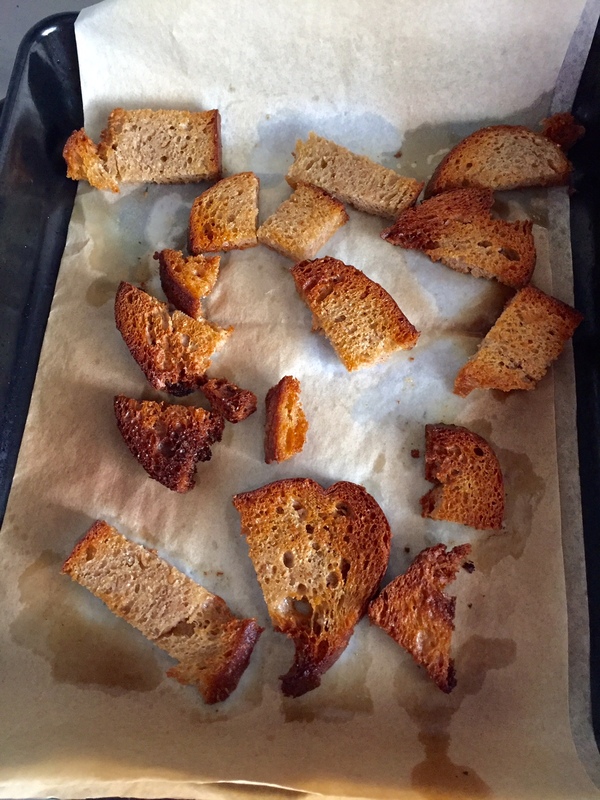 Bake until crispy, approximately 10 minutes. Remove from oven to cool. 3. In a serving bowl, add 2 tbsp olive oil to the bottom. (I just learned this tip to help better coat the lettuce in oil.) Add lettuce and mix well with oil. 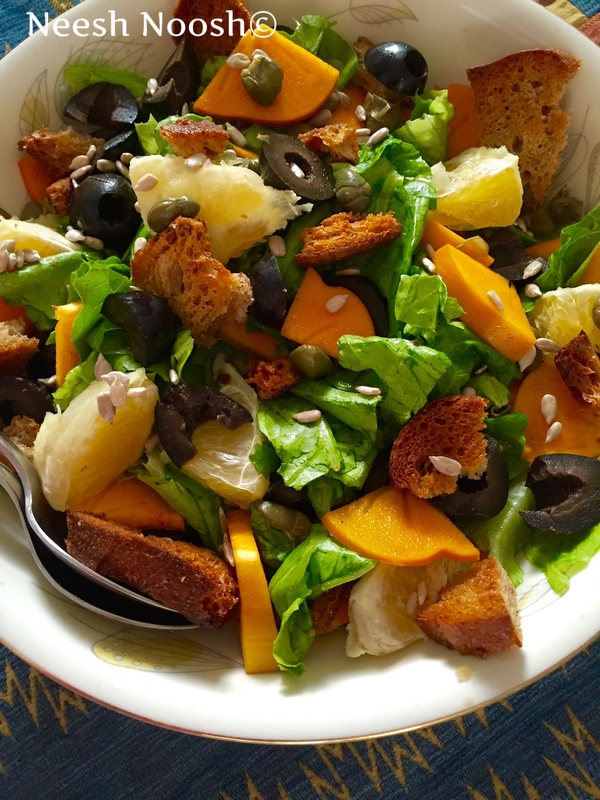 Add olives, capers, permission, orange, sunflower seeds and bread pieces to lettuce. Mix well. 4. Add freshly ground pepper. Taste to decide if salt should be added. Option to add the juice of the remaining half orange. Mix well and serve. PS: If you are interested in my other Chanukah recipe and articles, please click here and here. This entry was posted in Chanukah, Holiday, Kislev, Salad and tagged Chanukah, cooking, healthy, Kislev, kosher, recipes, Rosh Chodesh, salad, Torah, vegan by Sarah Newman. Bookmark the permalink. That salad looks dee-lish. Thanks Sarah! Thanks-I hope you enjoy it! I just learned to love persimmons and want to try this. I like the addition of breadcrumbs, it makes it a bit heartier this time of year. And it’s nice to have a non-latke recipe at this time of year too! 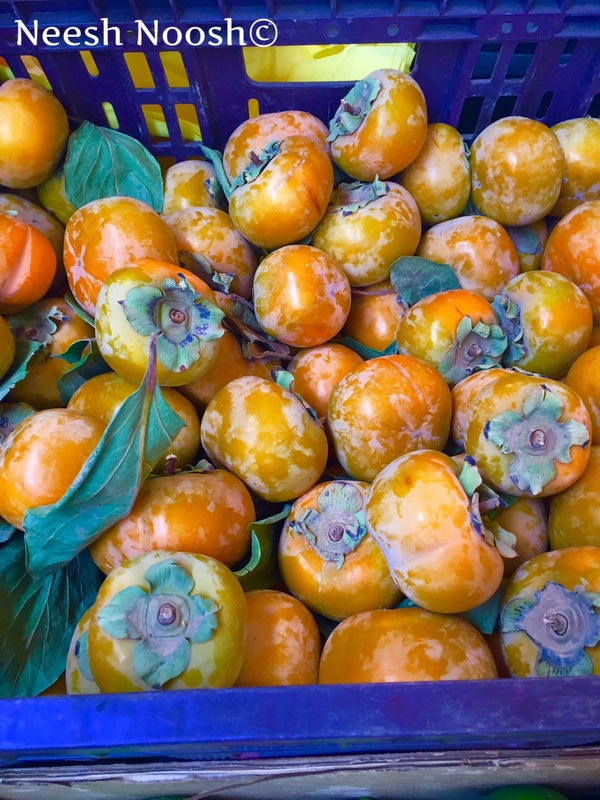 great-persimmons are delicious and I hope you enjoy the recipe! Enjoying all your beautiful Chanukah posts! Honestly I think if someone were to do a new Jewish festival cooking book it should be YOU!